A ceremony was organised to observe Youm-e-Shuhada at Bahawalpur Garrison here on Monday.The ceremony was organised to pay homage to the martyred soldiers who sacrificed their lives for defence of the country. Addressing the ceremony, Corps Commander Bahawalpur Lt-Gen Muhammad Haroon Aslam said that the sacrifices given by the Pakistani nation and Pak armed forces in war on terror were more than any other nation. 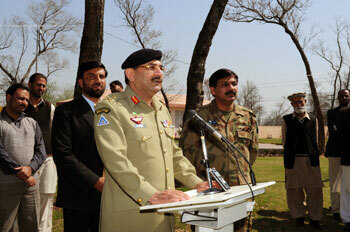 He said that April 30 was very significant for Pakistani armed forces. He admired the Pakistani nation which always stood with the Pak armed forces both in peace and war. Earlier, the Corps Commander laid floral wreaths on the monument of martyred soldiers and offered fateha. The ceremony was also attended by the families of martyred soldiers, civil and military officers. This entry was posted in News and tagged Lt Gen Haroon Aslam, Pak Army, Pakistan Army, Pakistan military, Pakistan news, Youm e Shuhada, YoumeShuhada. Bookmark the permalink.